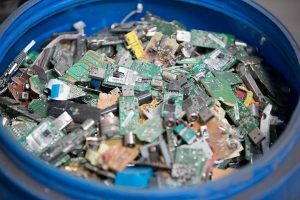 Researchers have looked at how the costs of e-scrap processing stack up against virgin mining, and their findings indicate recycling is more efficient for some key metals. The analysis, completed by professors Jinhui Li and Xianlai Zeng of Tsinghua University in Beijing and professor John Mathews of Macquarie University in Sydney, shows economic upsides in recovering gold and copper from e-scrap compared with traditional mining. “E-waste can be treated through demanufacturing, separation and physical reprocessing to yield economic quantities of pure metals like copper and gold, at an estimated cost that is considerably below the observed range of world market prices,” the authors wrote, noting that this continues to be the case even when residue disposal costs and government subsidies are taken into account. The results, detailed in a report titled “Urban Mining of E‑Waste is Becoming More Cost-Effective Than Virgin Mining,” are based off the authors’ examination of Chinese recycling companies. China was chosen because that nation is projected to be a larger generator of e-scrap than the U.S. or European countries in the years to come. China has also implemented “favorable policies” at various levels of government toward collection and processing of e-scrap, according to the study. “If these results can be extended to other metals and countries, they promise to have positive impact on waste disposal and mining activities globally, as the circular economy comes to displace linear economic pathways,” the authors wrote. The study analyzed virgin mining costs for copper, lead, steel, aluminum, gold and silver. It compared those costs with the cost of recovering commodities from CRT monitors and printed circuit boards. The researchers collected data from a handful of Chinese CRT recycling operations and came up with an average processing cost of $460 per ton of CRT monitors. A virgin mining operation, generating the same metals volume as that one ton of CRTs, would have to spend an average of $5,990, the researchers found. On the printed circuit board front, the average processing cost among a handful of recycling operations was $1,354 per ton. Obtaining the same volume of metals through virgin mining would require an average of $10,060, the study found. In determining the economic realities of material processing, the researchers considered a range of factors. “The costs of urban mining for e-waste encompass fees paid for collection, labor, energy, material, transportation, residue disposal, and capital costs of equipment and buildings,” they wrote. Co-author Xianlai Zeng told E-Scrap News that the study has implications not only for e-scrap recovery in China, but for operators around the world. He pointed to the volume of e-scrap exported out of the U.S. rather than processed domestically, and suggested that strategy could change as the findings are more widely recognized. “Now, when realizing the superior economic potential, the exportation may be declined in near future,” he said. The study also found e-scrap recovery provides low costs in relation to global market prices for certain metals. The most significant cost benefits were seen in copper and gold. For copper, processing costs fell from $6.70 per kilogram in 2010 to $1.70 per kilogram in 2015 in China, the researchers found. Meanwhile, the world market price for the metal in 2015 was at $6 per kilogram. Gold recovery costs from e-scrap declined from $8,438 per kilogram in 2010 down to $1,591 per kilogram in 2015, when the global market price was just under $4,000. Other metals remain cheaper to recover through virgin mining, the study found. The authors note that a Chinese government subsidy is factored into these calculations, and that it particularly makes the copper recovery equation more attractive, although even without the subsidy, copper recovery costs from e-scrap run below the global copper price. The calculation also doesn’t include residue disposal costs. Finally, the study notes that labor costs for e-scrap recovery change over time due to a “learning process” as companies figure out how to most efficiently process materials. This results in a lower labor cost per unit for a given device as that product becomes a larger portion of the waste stream, and is processed with greater efficiency.